After the qualifying rounds in Antwerp, many gymnastics pundits conjectured that Aliya and the other Russian gymnasts peaked at the European Championships and at the University Games in order to impress their country people. (The European Championships and the University Games took place in Moscow and Kazan, respectively). According to those pundits, the World Championships, held outside of Russia, were simply an afterthought for the Russian Gymnastics Federation, and some feared that Aliya would not medal in Antwerp as a result. If you look at the chart, you’ll notice that Aliya Mustafina’s scores hit a peak at the 2013 European Championships, and afterwards, her all-around scores gradually dropped. So, when Aliya had a disappointing performance during the qualifying round at Worlds, it was fathomable that the downslide would continue. Heck, it seemed perfectly plausible that Aliya would hit her 2013 nadir during the all-around finals in Antwerp. Fortunately for Musty’s groupies, the “Queen” turned into a magical gymnastics unicorn and bettered her all-around score by 1.691 during the all-around finals in Antwerp. Who saw that one coming? If 2013 taught us anything, it is this: Never discount Aliya Mustafina. Never. You know who else you can’t discount? Kyla Ross, the 2013 silver medalist in the all-around. Unless you’re brand spankin’ new to the gymternet, you know that Kyla Ross is reputed as being America’s most consistent gymnast. Well, based on the numbers, we’d have to say that Kyla deserves that reputation. Her scores may not form a perfectly straight horizontal line, but they come pretty darn close. Seriously, Kyla Ross is like the Ford Taurus of gymnastics; she’s one of the most reliable American products around. Note! 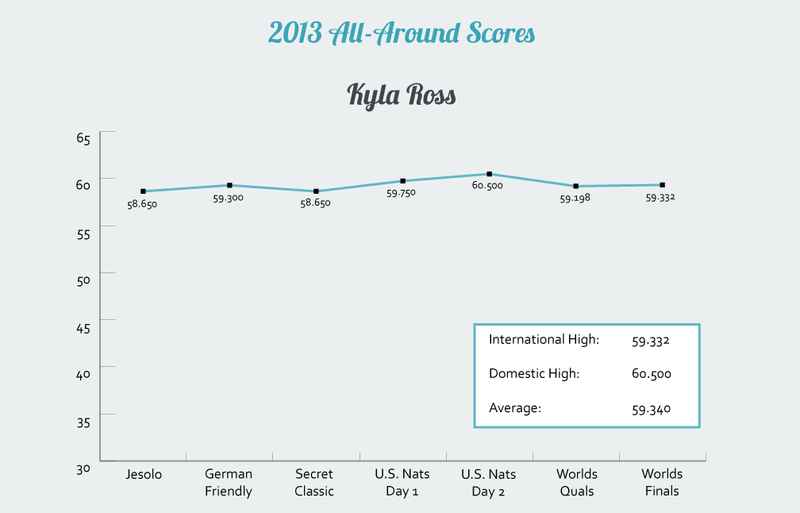 Whereas Kyla’s average international score was a 59.113 in 2013, her average domestic score was a 59.633. That’s quite a difference. The discrepancy could be the result of home-cooked scoring, but then again, maybe Kyla performs significantly better in domestic meets. Further analysis is needed. Finally, we arrive at Simone Biles, who–well, if you’re reading a post about gymnastics statistics, you probably know this already, but we’ll tell you anyway… She won the World all-around title as a first-year senior. NBD. Granted, Simone’s senior debut was not perfect. She fell on uneven bars at a friendly meet between the Germany, Romania, and the United States. Then, in July, an ankle injury forced her to withdraw from the all-around competition at the 2013 Secret Classic. After Simone’s rough performance at the Secret Classic, Marta Karolyi summoned Simone to the National Training Center and had a little chat with her. How Simone Biles didn’t have a heart attack, we don’t know. Can you imagine being sent to the Ranch for one-on-one time with Marta after you withdrew from a meet? Bricks = shat. *Since Simone did not finish the Secret Classic, her all-around score is not factored into the average. Sure, Simone biffed her bars routine on the second day of Nationals. She had mistakes, but generally speaking, her all-around scores evened out after she had that chat with Marta Karolyi. I mean, she scored 60+ three times after the Secret Classic! So, there you have it: A quick look at how the top 3 all-around gymnasts performed throughout 2013. What do you think? What was the biggest surprise for you? Actually , becoming the World AA Champion as a first-year senior had been done before: Shawn Johnson in 2007. Still a rare accomplishment. Go Simone! 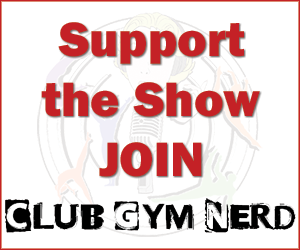 THANKS FOR A GREAT PODCAST AND my Gymnastics fix, Gymcastic!